Heat peas and 5 1/2 cups water to boiling in Dutch oven. Boil 2 minutes; reduce heat. Stir in ham, salt, onion and curry powder. Cover and simmer until peas are mushy, about 1 hour. Stir in 1 cup water. If necessary, add more water to desired consistency. 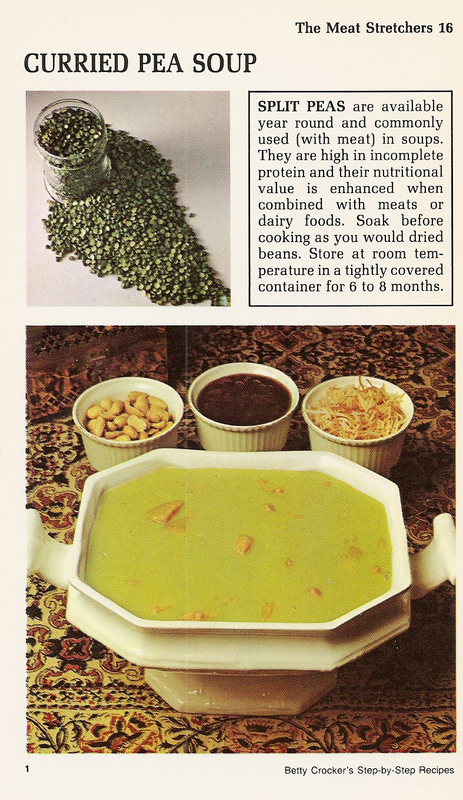 (Soup will thicken as it stands.) Serve soup with side dishes of peanuts, chutney, and toasted coconut. 8 servings. Note: To toast coconut, spread on ungreased baking sheet and bake in 350° oven, stirring frequently, until golden brown, about 15 minutes. Peanuts are such a rich source of protein that 1/3 cup can be substituted occasionally for a 2 – to 3-ounce serving of meat. Provide a gallery of peanut garnishes and snacks for your family and watch the protein show.